Single part red spot and glazing putty is excellent for filling scratches, sanding marks, pinholes, and other imperfections. Quick-drying and easy spreading with little or no drag. Minimal shrinkage. Works with lacquer, acrylic, synthetic, or urethane systems. 16 oz tube. Made in USA. Works great, and will buy again. 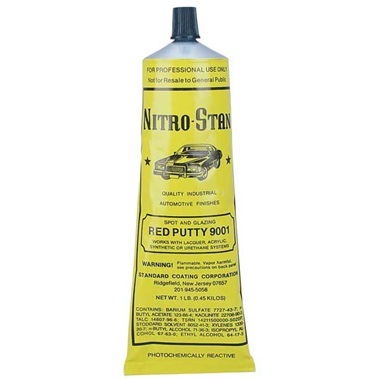 I use it on Radio Control Model Planes after the primer coat application. Fills in small imperfections. No more cleaning. Just tear off next sheet. Always clean.